In less than a month, my son will leave for college to pursue a degree in criminal justice. I am both immensely proud of him and terrified. So when a friend of mine created a simple bracelet of paracord and sliding knots in support of our police forces, I was inspired to pull out my long-neglected craft stash and design a copycat kumihimo bracelet. My objective was to design a pattern for a thin bracelet that is easy to modify according to skill level and available materials. The bracelet shown took three to four hours to complete, including gathering supplies. Cut embroidery floss into four equal lengths or measure and cut four two-yard lengths. 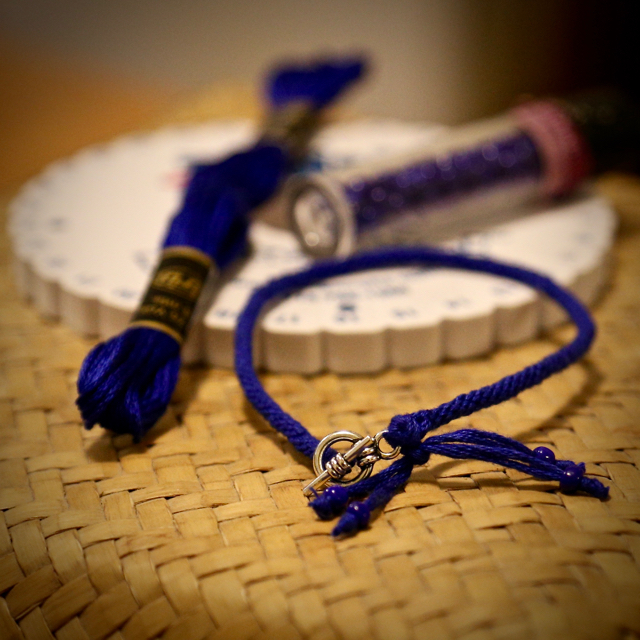 Thread each strand through one side of a fastener (the bracelet pictured above features a toggle clasp). Alternative: tie an overhand knot at the center of the strands, creating a small loop. Push the fastener or loop through the hole in the kumihimo disk and set up for an 8-strand braid (directions here if needed). Braid to desired length, using an optional weight to keep the braid taut. The bracelet pictured is about 7.5″ long. Finish by threading half of the ends through the remaining side of the fastener and tying into a square knot. Groups of two strands of floss may be threaded through a bead (as shown), then knotted and cut off. Alternative: braid ends into two strands and knot them through the loop on the other side, or make an overhead knot big enough to fasten through the loop, or tie on a button. May God bless those who serve and protect.